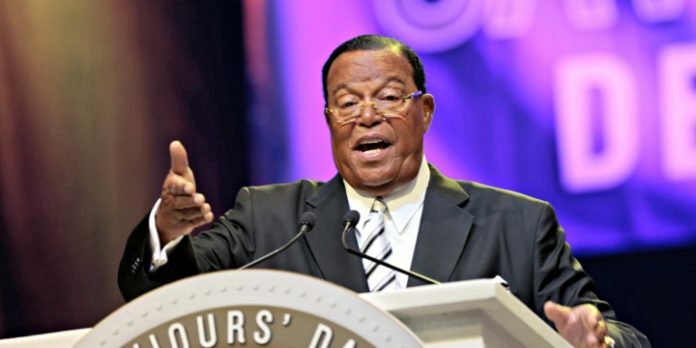 Nation of Islam leader and prominent antisemite Louis Farrakhan led chants of “Death to America” and claimed that “America has never been a democracy” on Sunday during a solidarity trip to Iran, ahead of the re-implementation of US sanctions on the country this week. In his remarks, he condemned the new American sanctions on Iran that will take effect on Monday. “Today, I warn the American government that sanctioning Iran is a big mistake,” he said. In addition, he stated that African-Americans are part of Iran’s Islamic revolution. At the end of his talk, Farrakhan led the chanting of the common Iranian refrains “Death to Israel” and “Death to America,” and was joined by members of the audience. Several prominent American activists and politicians have been linked to Farrakhan in recent years. Tamika Mallory, a leader of the Women’s March, praised him as “GOAT” or “Greatest of All Time,” and served as a national organizer of his 2015 “Justice or Else” rally. Linda Sarsour, another leader of the March who participated in the “Justice or Else” rally, has likewise praised Farrakhan and repeatedly refused to condemn him. Recently, a photograph surfaced of former President Barack Obama meeting with Farrakhan in 2005 while he was a senator.